Use Slack at Work? You can add Pocket to your Slack workspace to capture all the great content that’s being shared by your teammates throughout the workday. By integrating Pocket into Slack, you’ll have a dedicated place to save links to articles and videos that your colleagues have shared throughout the day. Later, when you’re commuting, catching up on reading during a flight, or kicking back on your couch at the end of the day, the things you’ve saved to Pocket will be there for you, whenever you’re ready. Continue reading to learn how to start using Pocket for Slack. What permissions does Pocket for Slack require and why? 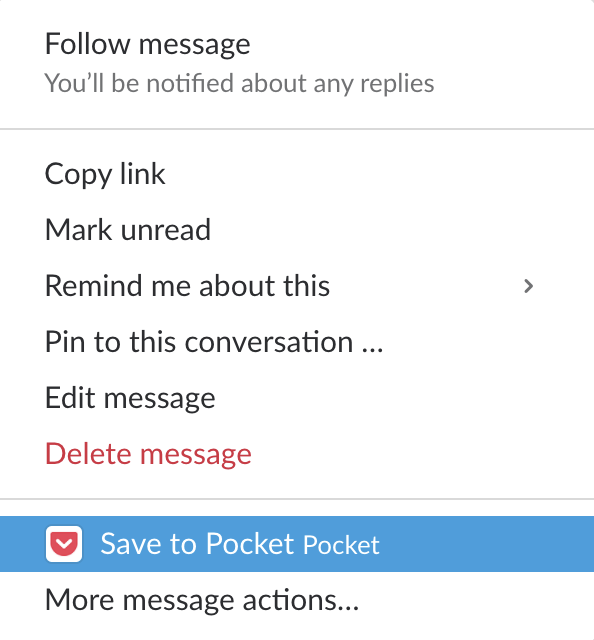 In order to install Pocket in Slack, visit the following page and then click Add to Slack. If you’re the Workspace Owner, you’ll be able to click Install to add Pocket to your Slack workspace. If you’re not the owner, simply click the Request Approval button to ask the owner to complete the installation. That’s it! Find a Slack post that contains a link you’d like to save, and click on the More Actions button (●●●). Select Save to Pocket. If you've already connected your Pocket account, you'll receive a private message from Pocket indicating that the link has been saved. Note: If you don't see Save to Pocket in this menu, select More messages actions... and then look for Pocket in the resulting popup. If it’s your first time saving to Pocket, you’ll receive a Slack message from Pocket, offering to connect Pocket to Slack. Click Connect Pocket to Slack to continue. Sign in to Pocket and connect your account. If you’d like to disconnect your Pocket account from your Slack Workspace, simply visit the Connected Services and Applications page, find Slack, and click the Remove Access link. When adding Pocket to Slack, you will be presented with a set of permissions that are required for the app to be used. Here's a brief explanation of why Pocket needs each permission. To learn about Slack Permissions in general, click here. Pocket requires this permission in order to include the “Save to Pocket” action in the ●●● menu, and to offer the “/pocket” slash command for saving URLs to Pocket directly. When the Save to Pocket action is invoked on a message, that message is sent securely to Pocket so the URL that’s included in the message can be saved to the user’s account. The message that is sent to Pocket is stored securely and temporarily for debugging purposes, and it is deleted after 2 days. 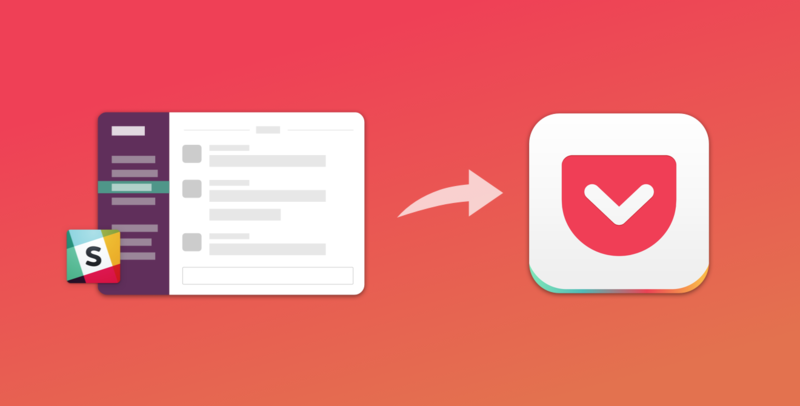 To allow users to connect their Pocket account to Slack securely, this takes place in a Direct Message with the @pocket bot.